Have you ever wanted to participate in a play but didn’t quite have the courage to audition? A new program from a familiar island face might just be the “spark” you were looking for to step up your courage. Erica Ress Martin is starting a new program called “Spark,” which she named for the specific meaning of the word. 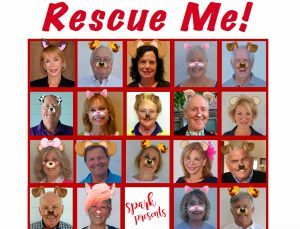 The first show, “Rescue Me,” is planned for Thursday, Dec. 6 at the Crowninshield Community House. Performances are planned for 5 p.m. and 7 p.m.
More than 30 performers will take the stage and sing songs to raise money for pets. Proceeds from the shows will go to the Suncoast Humane Society’s capital campaign. A group of women dressed as cats will perform “I Feel Kitty,” and James Martin will sing What’s New Pussycat?” while trying to decide which one to adopt. organization continues to grow to this day. She is hoping more nonprofits will contact her about doing shows and concerts to raise money for their organizations. Tickets for the “Rescue Me” show on December 6 are available now. The cost is $35. Call (941) 474-7884.